Home Disney Tips	Is Pixar Play Zone Worth the Price? Walt Disney World’s childcare option, Pixar Play Zone at Disney’s Contemporary Resort is a fun way to keep your kids entertained and enjoy a parents’ night out. But is it worth it? At 10pm on a Tuesday night when I picked my boys up from their evening at Pixar Play Zone and saw their beaming smiles, I knew it was worth it. They legit couldn’t stop talking about their exciting evening and they were both so animated and excited that I’m still kicking myself for not recording it. I can’t wait to tell you all about this fun new kids club at Walt Disney World Resort so read on for everything you need to know before booking an evening for your little ones at Pixar Play Zone. 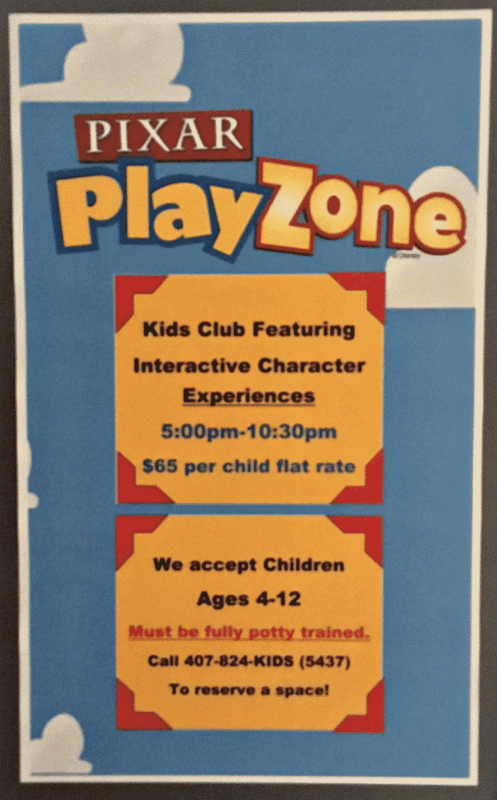 What is Pixar Play Zone? If you are familiar with the (now closed) Children’s Activity Centers at Walt Disney World like Lilo’s Playhouse or Sandcastle Club, or you’ve experienced the freedom that the Oceaneer Club/Lab on Disney Cruise ships gives parents, you’ll be familiar with the setup at Pixar Play Zone. For everyone else, here’s how it works. Pixar Play Zone is a safe and fun area just for kids at Disney’s Contemporary Resort with opportunities to play, make crafts, interact with characters and have dinner in a supervised environment while parents enjoy a night out. It’s more than JUST babysitting, but essentially, it’s babysitting….but with a DISNEY twist. What is Included at Pixar Play Zone? Kids will be given one snack and dinner during the evening, which you will help them choose upon arrival. My boys went with pepperoni pizza, and chocolate milk for dinner. For dessert, one chose a cupcake and the other had cookies. Oh and they also had rice krispie treats for a snack. And yes, there are healthy choices as well. But we don’t judge here. It’s Disney after all! On top of dinner, kids will have character interactions, craft time and virtually unlimited arcade games! While characters and activities are subject to change, my boys got to meet Woody and Jessie (who TALKED apparently and gave a cowboy oath), had a dance party with Mr. and Mrs. Incredible and got to make a Space Ranger craft. Again, I’m not sure how often this changes, but you can at least count on something similar. 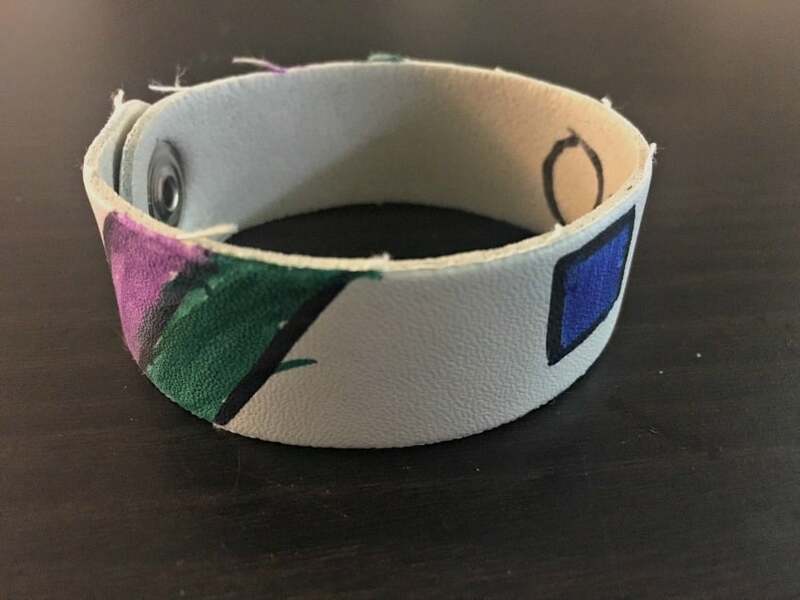 Oscar made this cool leather bracelet. 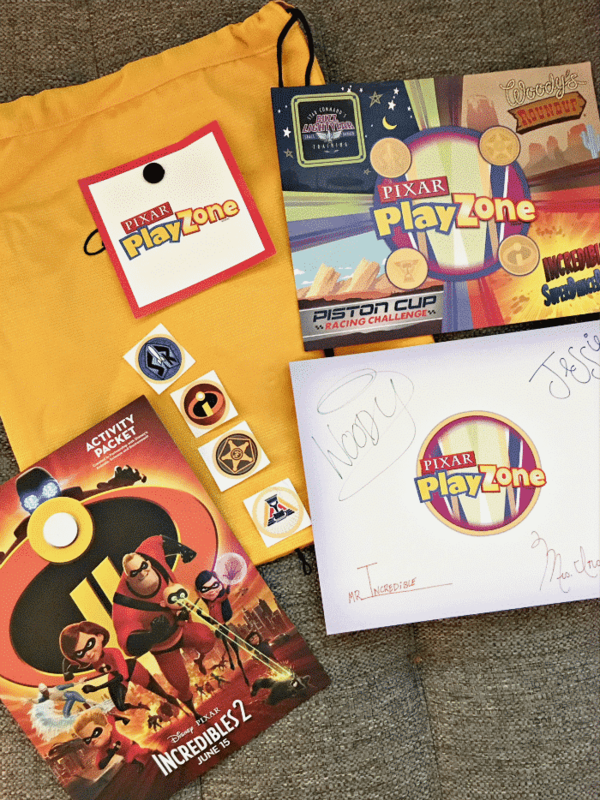 At the end of the evening, they were each given a drawstring backpack that included an activity booklet, stickers and a Pixar Play Zone card with all four character autographs on the back. That was a total surprise for all of us and so cool! Overall, I felt like we got our money’s worth both for the kids and for me. Want to know what Oscar thought? Here’s a quick interview I shot after we got home. What is the Cost of Pixar Play Zone? The use of Pixar Play Zone is not what I would call budget-friendly at $65 per child. I’m not going to sugar-coat it, making that reservation was a real hard pill to swallow. That said, when my family visits Walt Disney World, I plan for a few splurges for myself and the boys. And knowing that I would be with them solo for much of this trip while Jerry was at his convention and also knowing how much they loved kids’ clubs in the past, I decided to go for it. If you make a reservation, you should be aware that you’ll pay in advance (in full) at the time of booking and have until 24 hours prior to your date to cancel without penalty. When I picked up the boys, I was SO thrilled when they came running out full of stories and smiles. 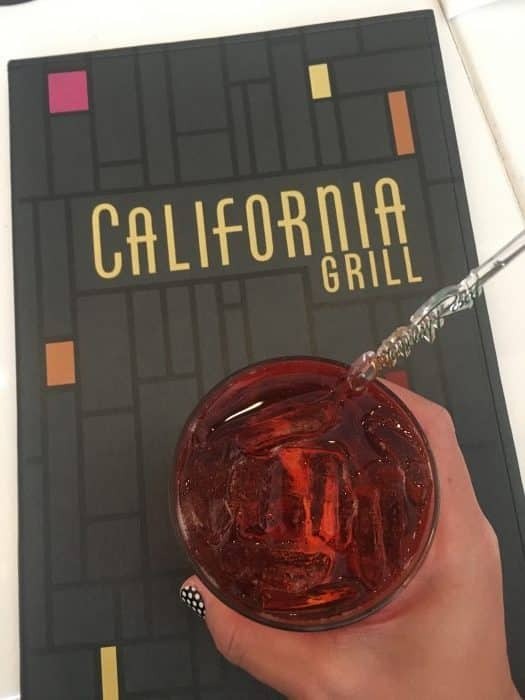 Beyond that, I had an incredible dinner with my friend right upstairs at California Grill and it was the perfect way to have a nice little break with some grown-up conversation. 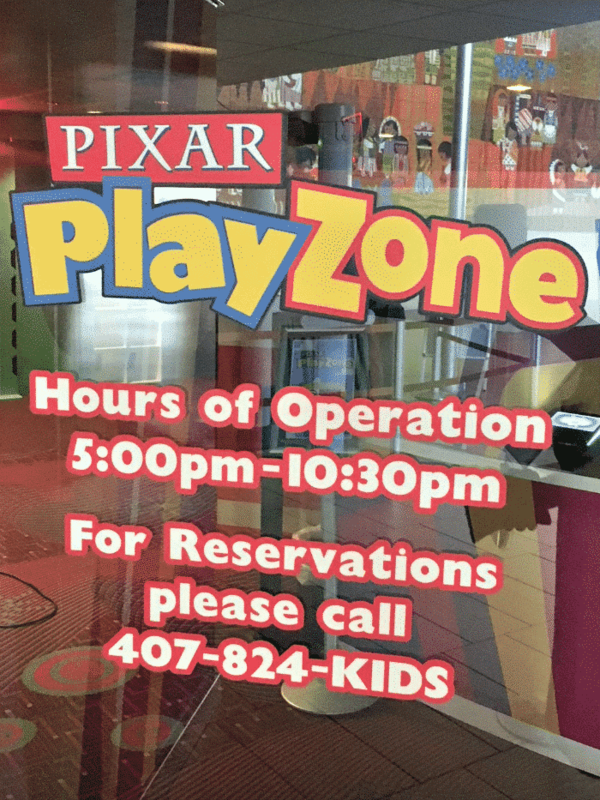 Reservations for Pixar Play Zone are highly recommended (call 407-824-KIDS) but don’t let that stop you if you’re looking for a last minute booking. They will accommodate walk-ins as long as space is available. 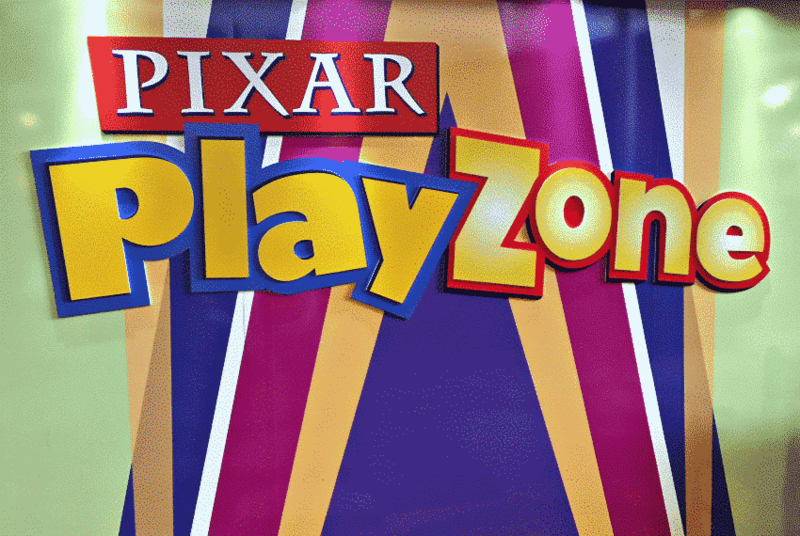 What are the Hours of Pixar Play Zone? Once you have your evening selected, you may arrive as early as 5pm to get your kiddos registered. You’ll want to allow about 10-20 minutes for registration depending on how many kids you have. There’s a little bit of paperwork to fill out for each child with contact, health, and dietary information. Once the kids are all settled in, enjoy your adventure! Just remember that you must be back by 10:30pm before Pixar Play Zone turns back into a pumpkin and your credit card gets charged late fees BY THE MINUTE. Seriously, y’all. Don’t be late. Children must be between the ages of 4-12 and fully potty-trained to be allowed into Pixar Play Zone. In fact, parents aren’t even allowed in! When you arrive and enter through the glass door, there is a front desk area and a visible hand-washing station beyond a gated area. Once your paperwork is filled out, children are given wristbands and admitted into the play zone. All kids wash their hands before running off to play (just like on a Disney cruise). I worried that one of my kiddos left his MagicBand in the room but was happy to hear they aren’t required here. 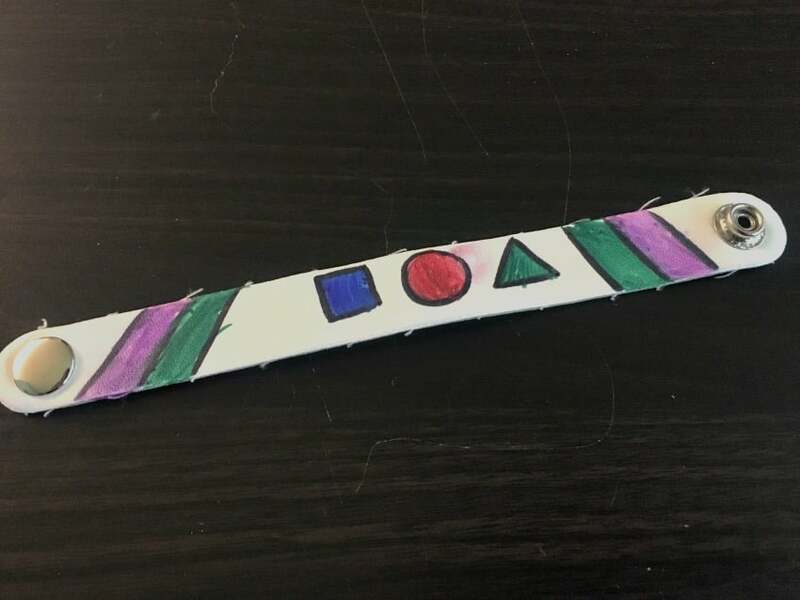 In fact, they asked that I take my other son’s band and hold onto it so it wouldn’t get lost. The temporary wristbands are all they will need. A NOTE ON BATHROOMS: If your child needs to use the restroom during his/her visit, they will have to be escorted from the Pixar Play Zone to the bathrooms nearby. This is the one downfall in my opinion as I can see how some people wouldn’t be entirely comfortable with that situation. That said, my boys said they felt totally safe and had no issues with bathroom time. Finally, if your child has any allergies or special dietary needs, Pixar Play Zone will accommodate them with the same care you have come to expect all over Walt Disney World Resort. Pixar Play Zone is located on the 4th floor of Disney’s Contemporary Resort just across from the main gift shop. If you are familiar with the resort, you’ll notice that it occupies the space that once was the arcade (hence all the fun and free arcade games). If you plan to enjoy the resort while your kids play, you can park for free for the evening. Just tell the parking attendant that you have a reservation at Pixar Play Zone and you’ll be directed to self-parking or valet. If you are staying at another Disney resort or don’t have a vehicle, it’s also fairly easy to take the bus to Magic Kingdom and walk over to the Contemporary. Or if you don’t want to take the time, Uber and Minnie Vans are just an app away. I love that Pixar Play Zone is at Disney’s Contemporary Resort because there are so many things to do nearby! The location was the perfect fit for me because I planned to head up to dinner at California Grill. This would be my number one recommendation not only because it’s close by, but it really is one of the best meals you can get on Disney property. I’ve dined there with and without my kids and while I love it either way there is something special about a nice quiet evening. Not to mention a spectacular view of the nightly fireworks! If you want to skip the sit-down dinner and enjoy some of your favorite attractions, Magic Kingdom is just a walk or monorail ride away. If you’ve never enjoyed Magic Kingdom WITHOUT your kiddos, I highly recommend it! The entire park changes when you are there with a friend or spouse. Totally different experience. Or you could go out the back door and take a boat over to Disney’s Wilderness Lodge for signature dining at Artist Point or stay on the boat until you reach Fort Wilderness for a rustic evening around the campfire or a meeting with The Headless Horseman. Finally, you could do a monorail crawl with drinks at Trader Sam’s Grog Grotto at Disney’s Polynesian Village Resort, appetizers at The Grand Floridian Resort and Spa, dinner at The Wave and fireworks on the 4th floor observation deck at Disney’s Contemporary Resort. Just make sure you’re back by 10:30! As you can see, the possibilities are fully customizable and virtually endless. And hey, maybe you want to sit in a chair and watch the water in peace. You can do that too. It’s so easy to fully plan a Walt Disney World vacation around the kids’ interests, sleep schedules, their food needs and their whims. And Disney is AMAZING for kids. 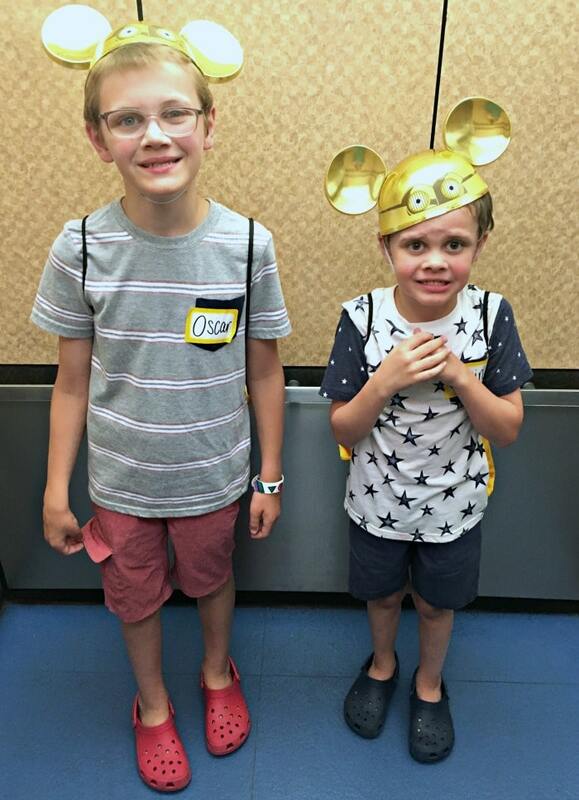 I happen to think Disney is amazing for grown-ups too and I am so happy to have the option to let my kids do something fun while I catch a break. So fun!! Our kids would love this!! I didn’t even know that there was a Pixar Play Zone! Adding it to my bucket list. Thanks for the tips! It’s really a fun option. I hope you have a chance to try it out. Thanks for reading!